India’s tryst with telecommunication began with the laying down of the first telegraph line between Calcutta and Diamond Harbour in 1850 and setting up of a separate department of posts and telegraph in 1854. Since then India has come a long way from ‘land line phones’ to ‘GSM’ mobiles. The telecom revolution in modern India began during the liberalisation period (1990) when the mobile phone subscribers increased from just 10 lakh to 94 crores until December 31st, 2014, making India the world’s second-largest mobile phone user base (TRAI, 2014). After the opening up of the economy in 1990, private investment in the sector of Value Added Services (VAS) was allowed and cellular telecom sector was opened up for competition from private investments. It was during this period that the Narasimha Rao-led government introduced the National Telecommunications Policy (NTP) in 1994, which brought changes in the following areas: ownership, service and regulation of telecommunications infrastructure. The policy introduced the concept of ‘telecommunication for all’ and its vision was to expand the telecommunication facilities to all the villages in India. Liberalisation in the basic telecom sector was also envisaged in this policy. The LPG (Liberalisation, Privatisation & Globalisation) policies of the 1990s created huge inequalities in society as we focused more on growth and less on distribution. One such inequality related to telecom sector is between ‘digital haves’ and ‘digital have not’s’. As it is said that India lives in its villages, it has created a huge rural-urban digital divide as development in telecom sector was focused mainly in urban areas leaving the rural people behind. This is the challenge for the future policy makers to reduce this digital divide between rural and urban people. My study focuses on how people in two panchayats (Kakarmala and Barar) of Rajasthan were accessing mobile phone technology, two decades after the country opened up to the mobile phone revolution. My first field trip was on October 27, 2014, to October 31, 2014. I had been to Khakarmala Panchayat of Amet Tehsil in Rajasamand district of Rajasthan. In my second field trip from November 4, 2014, to November 8, 2014, we had been to Barar Panchayat of Bhim Tehsil in Rajasamand district of Rajasthan. The Khakarmala Panchayat had no internet or mobile connectivity, whereas as the neighbouring village Nanana, which was just 2 km away had network coverage. The main reason for this is the hilly topography of Rajasthan and while travelling from Nanana to Khakarmala. This was creating a Rural-rural digital divide between the two villages. ASHA workers in Rajasthan were using their mobile phones to contact Auxiliary Nurse or Midwife (ANM) and doctors before bringing a pregnant woman to the Primary Health Centre (PHC). It can be said that usage of the mobile phone by ASHA workers in an effective way has reduced the MMR to some extent. I compared this with a similar service in my home state Karnataka, in the south of India. Mother and Child Tracking System (MCTS) in Karnataka: an example for usage of mobile phone effectively in public service delivery. This is a centralized web-based application for improving delivery of health care services to pregnant women and children up to five years of age through name based tracking of each beneficiary and monitoring service delivery. The ASHA worker identifies the pregnant women in her locality and persuades her to come to PHC for health checkups. Once the pregnant women visit the PHC for the first time her mobile phone number is noted down in a registry and fed into a computer database which in turn sends SMS to the mobile phone of the pregnant women informing her of the next due date for a check up. Once the baby is delivered periodic SMS are sent until the baby turns five years informing the mother about the immunisation and vaccination programs being run in her locality. Also, nutrition tips for feeding the baby are sent over the phone.This kind of public service delivery system using mobile phone has helped Karnataka to reduce MMR and IMR. The state was awarded the Rockefeller foundation innovation award in 2011 for making use of technology effectively for public service delivery. Few farmers in the villages we met were using their mobile phones to call ‘kisan call centre’ (1800-180-1551) to get the market price of their produce so that they are not cheated by the middlemen who directly buy from the farm of the farmer. The villages we had been to, had a huge outward migration of the male family members. So the women in the house used their mobile phones to stay connected with their male relatives and children. The college-going youth in the villages used mobile phones to stay connected with their friends via Whatsapp and Facebook. 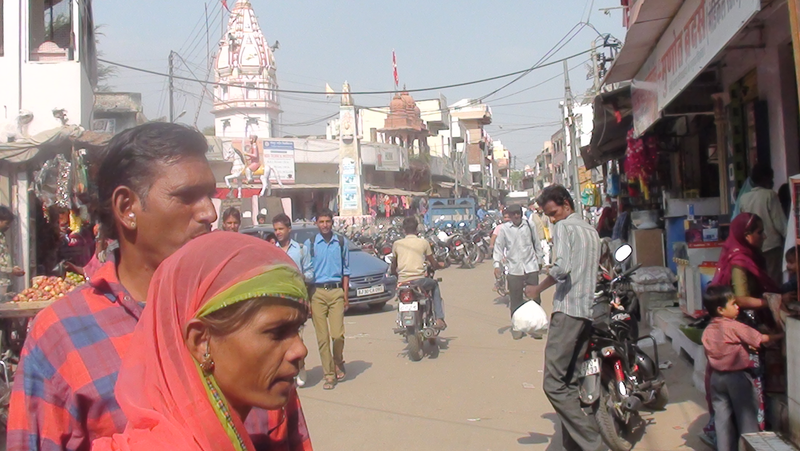 The picture below shows a place called as Badnaur Chauraya in Bhim town where the study was conducted. This is the place where people from surrounding villages congregate on every Thursday to participate in a fair. This fair is usually organised on Thursday because it is a holiday for MGNREGA workers in Rajasthan. The study was conducted in this area by interviewing 5-6 mobile shop owners. The number of mobile shops has increased from 15 in 2008 to 90 in 2014. This shows that the mobile phone market is expanding and the demand has increased enormously and hence the number of shops. Spice (M-5007) is the most sold mobile phones in the Bhim market. 20-30 pieces of Spice (M-5007) mobile are sold every month per shop depending on the location of the shop. The reason for people choosing this one particular model over the other is that it is cheaper, simple to operate, supports regional language and has long durability. Almost 60 percent of the mobile phone owners subscribed to ‘Airtel’ network, 30 percent of them to ‘Vodafone’ and the remaining 10 percent to BSNL. The reason for this is the quality of network offered by the private players and easily available SIM cards at low cost. I happened to talk to two women in the mobile shops who were buying mobile phones from the savings they had done by working under MGNREGA. It is no doubt that MGNREGA has increased the purchasing power of the people and also empowered the rural women by putting money into their hands as more than fifty percent of the MGNREGA workers are women. It is not that only literate people can use the mobile phone, but also the illiterate can operate the basic function of receiving and making a call. So mobile phone is no more a luxury good, it has become a basic necessity for the people and has become a part and parcel of their life. So mobile phones have been as indispensable as the three basic necessities of life, namely, Roti, kapda, makan – “Roti, kapda, makan aur mobile phone”. Mobile phone technology is a wonderful platform that still needs to be explored for effectively delivering public services. The TRAI data shows that mobile phone penetration India is skewed towards urban centers with a teledensity of 142 percent whereas rural areas witnessing a teledensity of 40 percent. So one has to take this huge digital divide into account before deciding to make mobile phones as the core for the beneficiaries to receive their entitlements. Mobile phones with internet connectivity would make life simpler for the citizens to access services of the government. Also, it is very important to provide internet connectivity to the panchayat offices as they are the main source of contact for the people in villages. So the Government of India in 2011 has come out with a project called as National Optical Fiber Cable Network (NOFN) to connect 2 lakh odd Gram Panchayats with broadband connectivity so that the people in the rural areas can access the government services offered over the internet. Also, few initiatives like ‘internet.org’ by social media website Facebook which offers to provide free internet facility by placing drones over an unconnected locality would go a long way in bringing down the rural-urban digital divide in India. So connectivity should be seen as a basic human right in future for the all round development of the country. Bharat Broadband Network Limited (n.d.). Project National Optical Fibre Network (NOFN). Retrieved on 27 February, 2015 from http://www.bbnl.nic.in/content/page/national-optical-fibre-networknofn.php . TRAI (2015, February 6). Highlights of Telecom Subscription Data as on 31st December, 2014. In Press Release No. 11/ 2015. New Delhi: Telecom Regulatory Authority of India.